This store is squarely aimed at tourists. It's a souvenir and gift shop, and practically a one stop location for all of your Bucharest souvenir shopping. Yes, there are other memorabilia that you cannot find here, but for a tourist looking to hurriedly purchase things to take back home there is nowhere else to go. 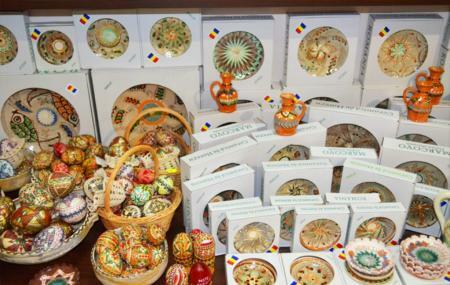 Clothes, fridge magnets, mugs, key-chains, chocolates, confectioneries, kitchenware, handicraft, ceramics, postcards - all of it wonderfully and authentically Romanian. In addition to their normal merchandise they also offer printing and decorating services. The staff is extremely helpful. How popular is Romanian Boutique? People normally club together Carturesti Verona and Baneasa Shopping City while planning their visit to Romanian Boutique. Nice place to buy your souvenirs in the city.. good prices and friendly staff!! This shop has a high variety of souvenirs at great prices, the staff was really helpful. We'll definitely come back when we'll visit Romania again. This shop has the best quantity-quality. The prices are better than the other souvenir shops around and the guys there are really helpful. Easy 5 star! Best souvenir shop in bucharest. Offers largest selection, half priced than other shops. Great service by shop manager. Open late into the night. Nicely stocked shop for every taste.